October 2016 | Pentaflex INC. October 2016 | Pentaflex INC.
October 24, 2016 /1 Comment/in Events /by Pentaflex Inc.
We aren’t just a company. We are a part of the communities we serve—the local community and the manufacturing community. It isn’t often that those two groups come together but they do on Manufacturing Day. We feel it is important to participate and open our doors to show off our skills and what manufacturing means to us. 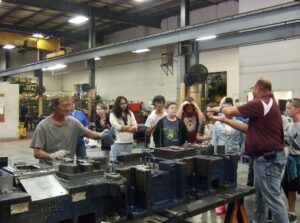 This year Manufacturing Day took place on Oct. 7th. Since its inception we have been involved in hosting events and showing the community what we do. There is no better way to explain something than to demonstrate it. That’s what Manufacturing Day is all about—onsite experiences. Manufacturing is an important industry and Manufacturing Day lets us showcase our skills and abilities. This year we hosted 270 middle schoolers at our facility. They were given a tour of the plant, demonstrations of the machinery and equipment, and an opportunity to discuss manufacturing’s importance to our local and national economies. As manufacturing is ingrained in our Ohio history and culture, this is a way to celebrate all that has made our state a leader in innovation and industry. By opening our facility to middle school students we hope to influence them and show them what a career in manufacturing is all about. Many students, and adults, haven’t seen the technological influence that has shaped the current industry. Hi-tech computers and automation are integral factors in today’s manufacturing operations. We believe in events such as this to promote our industry and its benefits for our country, while (hopefully!) inspiring the next generation of manufacturing professionals.